I bought this lovely pot of white muscari at my local garden centre this week for only £1.40....bargain! I have a garden full of the blue version which, although we moan about it, I do actually like very much. But this white version is very special, it seems to have a special serene quality.....and it smells lovely too, which is a bonus. I used a few of Kim's textures, but the main one was 'Phoebe'. Still plodding on with my needle cases. And my fabric weaving now feels like a single piece of cloth.......ready for embellishment. Off now to look at my Bloglovin' list. Have you discovered it yet? Its a great way of keeping up to date with your favourite blogs......and for finding new ones. Linda, the white muscari are so pure and soft - I've not seen them. A lovely collage of each. Your needle cases are just beautiful!!! I bought some blue muscari recently and am watching them gradually come into flower. The white ones are beautiful. Love the needle cases and your woven piece. 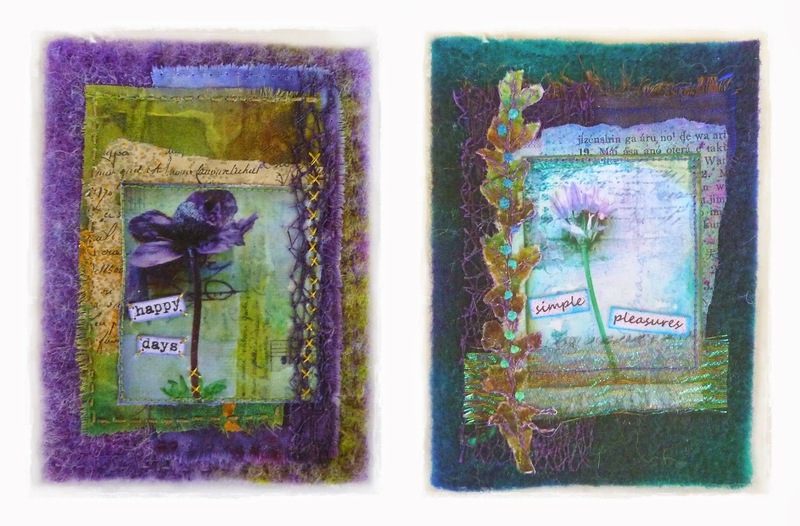 Lovely serene flowers but no more lovely than your art work. Your colors are soooo gorgeous! 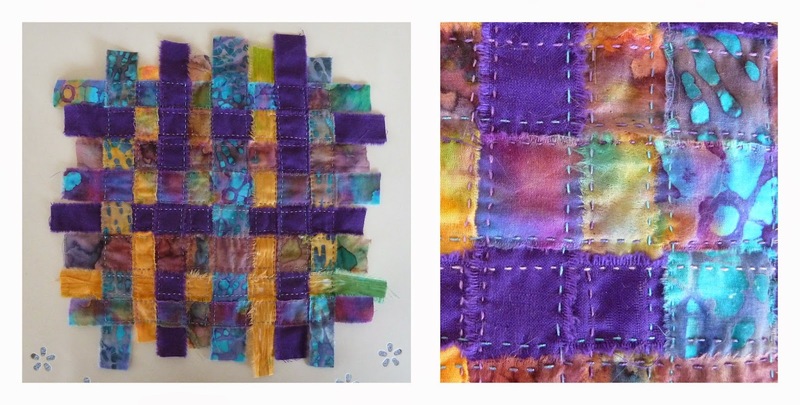 Your weaving looks beautiful, especially with the lovely even stitching. Bring on the embellishment! Beautiful Texture Tuesday piece and your weaving is gorgeous, of course. I love the white muscari too ... so pretty ! And your needle cases are wonderful ! 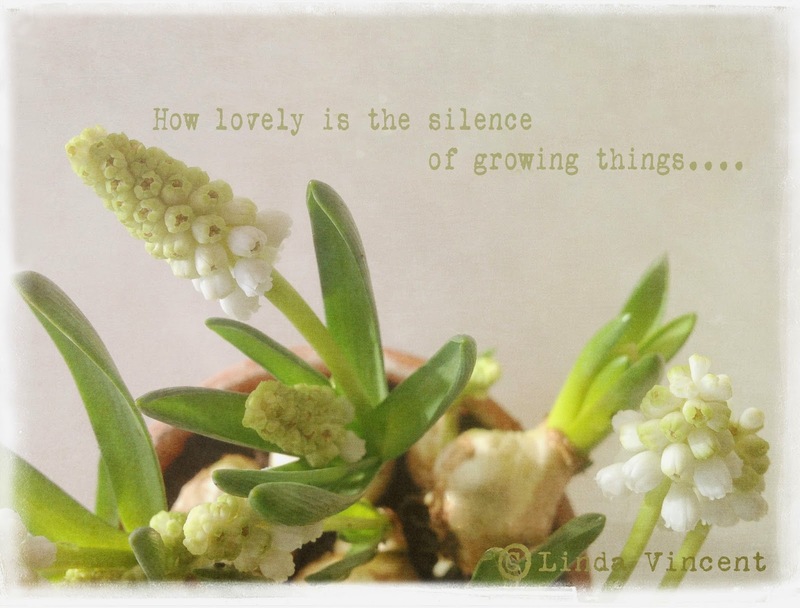 Love your collage of the white muscari, very pretty :) Your needlework is beautiful, I love the colors. Inspiring work you show here. I love how you piece your materials together and your photography work is beautiful. 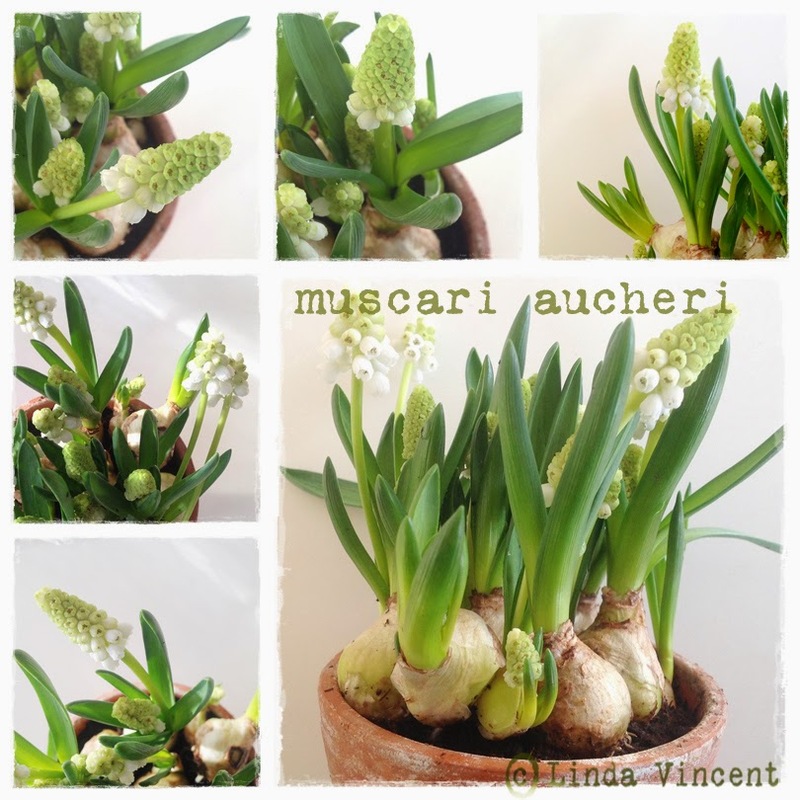 Hi Linda, love the white muscari, not seen white ones before, only blue, do they have pink ones I wonder? Would that be Tro**ll garden centre by any chance? If it is, I can ask my friend to pick me a pot or two up as they live nearer to it than I do! As always, loving your work. You always use colour combos that I like! Beautiful photos. Your needle cases are progressing nicely - great idea! Your needle cases are coming along nicely as is your piece of cloth. Is there a name for it? your whites with the bulbs showing in the pot are really splendid too! Very beautiful and you have made them more so.